Count Grassalkovich ordered the building of the Summer Palace by an unknown architect – most probably Artur Mayerhoffer after 1760. Count Grassalkovich ordered the building of the Summer Palace by an unknown architect – most probably Artur Mayerhoffer after 1760. 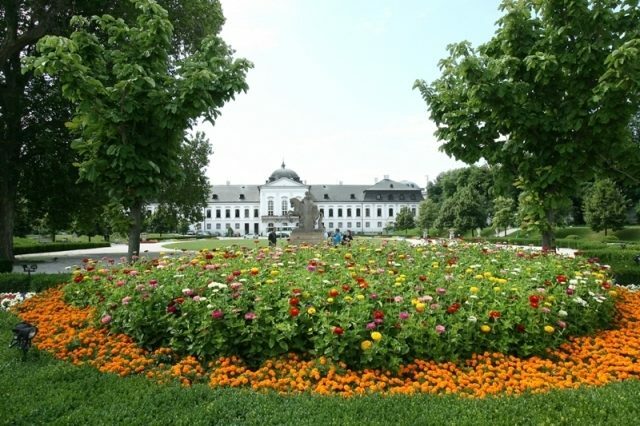 The cour d’honneur abutted the Palace from the south side, closed by the railings and an axially designed garden from the northern side, known as Grassalkovich Garden, behind today’s Presidential Palace. Its current structure suggests the approximate original appearance. A total of 12 pieces of playground equipment are in the garden, such as swings, beams, horizontal bars, trains, tic tac toe and various jungle gyms. All are made of black locust wood and therefore do not disrupt the space.